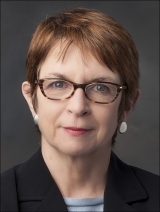 Dr Wendy Thomson, CBE, has a distinguished career in public services in the UK, and joined McGill University in June 2005 as Professor of Social Policy and Director of the School of Social Work. Her research interest is public service delivery – making policy work in practice for the people they are intended to serve. Currently she is involved in OECD and UN initiatives in governance and public service reform internationally, and with DFID (UK) in West Africa. She was appointed to the Board of the Agence de Santé et Services Sociaux de Montréal, by the Minister of Health & Social Services and is participating in one of the ten Knowledge Impact in Society (KIS) projects that has received funding through SSHRC entitled Evidence-Based Management in Child Welfare Services. Until May 2005, she was working in 10 Downing Street as Tony Blair’s Chief Adviser on Public Service Reform. She was previously Director of the Audit Commission in the UK (responsible for inspection of local government services across England and Wales), and Chief Executive of the London Borough of Newham. Wendy was born in Montreal and before moving to the UK, she was involved in social services in Montreal – at Head and Hands, Centraide, Family Services Association and Elizabeth House.